With the pristine charming beauty and the amazing tourist destinations, Phu Quoc has increasingly attracted more and more visitors. 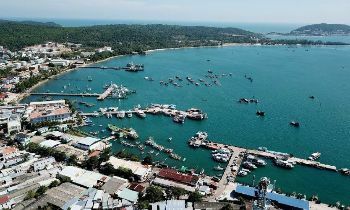 Besides the famous spots such as Tranh stream, Thom beach, etc, there are several unusual destinations that can offer visitors the unique tourist experiences as well as show them the distinctive slices of Phu Quoc life. Here is our suggestion of top unique sights in Phu Quoc, which you may want to know. Actually, very few travelers know about this attraction; however, when getting there, visitors will surely be enchanted by its magnificent landscape. Located near Duong Dong lake to the Northeastern Phu Quoc island with seven gorgeous waterfalls, Da Ngon stream is truly blessed by nature. It is totally distinctive from many other streams. The remarkable thing about Da Ngon is that the water here impetuously pours down in both the rainy and dry season. It is the perfect spot for outdoor activities such as picnicking, climbing, discovering the primeval forest or spring baths. If you are looking for something adventurous, Da Ngon is for you since it is one of the best things for those daring themselves of challenging themselves adventurously. Apart from immersing in the cool and refreshing spring, visitors can also make the most use of Jacuzzi lake that is an only natural lake in Phu Quoc island. The best time to visit Da Ngon stream in the dry season (frequently November-April) because it’s fairly dangerous in rainy season since the waterfall often runs very fast. Vietnam is the one of the world's leading exporter of black pepper and all the best quality products are harvested from Phu Quoc. Producing over 400 tons of the incredible black pepper every year, Phu Quoc offers the black pepper that owns the stunning natural flavor. In Phu Quoc, the black pepper is regarded as a key economic strength as well as a local specialty, helping dwellers to develop the local economy. It is easy to find the farms of black pepper all over the island's central and northern part. Black pepper is widely planted at some hamlets such as Suoi Da, Suoi May, Ganh Gioand especially at Khu Tuong. The farmers here are very friendly and usually warmly greet any tourists coming to their farm to explore the gardens as well as the whole process of producing black pepper in detail. After harvesting, the farmers will dry out the ripe pepper in the sun for at least ten days and then they select pepper carefully for the upcoming process. All the steps make Phu Quoc pepper have its own extraordinary flavor and quality. Setting foot on the pepper gardens, visitors will take a chance to not only observe with their own eyes how pepper is grown but also get more ideas about the traditional method of planting pepper to have a local plant specialty. It's a good idea to can buy directly pepper grown in gardens as a gift for your relatives in your hometown or even for yourself to save Phu Quoc's taste in your mouth when you are far away. You are highly advised to buy black pepper instead of white pepper since the farmers scrap the skin of pepper to turn it into the white one. This process can reduce the quality of peppers. 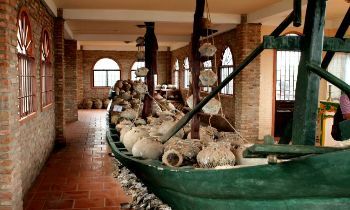 Phu Quoc is extremely famous for its high-quality fish sauce that is exported all over the world and is a significant contributor to the local economy. Fish sauce is a kind of dipping sauce which is used in most Vietnamese dishes to complement a saltiness flavor. At first sight, the huge wooden vats can make you think you are there for a wine tasting, but the festering smell of fish sauce essence will take you back to reality. Most of the fish sauce produced here are exported throughout the country for domestic consumption, besides an impressive amount makes its way to kitchens in Japan, Europe, and North America. Visitors mustn't pay the admission fee to enter, however, travelers should take a guide along with them unless they speak Vietnamese. Visiting the fish sauce factory, you can observe the scale of producing the sauce and a process for creating the droplets scrumptious sauce. Phu Quoc fish sauce is rich in protein (36-40) with the sweetness and fragrance of the rice-fish that can be only found in Phu Quoc. Sim Wine (also known as Rose Myrtle wine) is a special type of wine on Phu Quoc and is made from fruits of the Rose Myrtle tree. In the Mekong Delta, Phu Quoc is the only area where Myrtle can be planted. Sim wine is produced naturally by fermenting traditional left-sim from forests with white sugar and alcohol may be added to enrich the concentration. Alcohol Sim owns the distinct aroma of forest myrtle, combining with the sweetness and acrid, all of which create an exquisite flavor. When visiting the Sim wine factory, travelers will take a chance to observe the process of making the delicious wines from sim fruits from the skillful owners. Moreover, why don't you get some bottles of great sim wine as gifts for your relatives? In Phu Quoc, there are lots of Sim gardens and it's a good idea to visit these wonderful gardens, especially in the right Sim blooming season. With the extraordinary beauty, it’s no surprise that Phu Quoc tour is always on the bucket list of any travelers when coming to Vietnam. These unique spots will surely offer you the unique and exciting experiences. Let’s visit these above places and have a memorable trip.